CloudBet are a popular bitcoin-only sportsbook that welcome U.S. Citizens. Wager in-play on every major league: NFL, English Premiership, NBA and more. Create a new betting account in seconds without having to do KYC or ALM. ​Established in 2013, CloudBet is based out of Montenegro, and is one of the leaders in bitcoin-only iPhone sports betting. This means that players are required to make their deposits, withdrawals, and wagers using bitcoin, as opposed to other sportsbooks that give you the option to play with other forms of currency. While this may restrict players who are not able to get bitcoin quickly, the bright side in this is that CloudBet provides a solid mobile sports betting experience for those who have access to bitcoin. CloudBet's mobile interface is stunning, frankly. Their home page gives you easy access to betting markets for the most popular sports, including the NFL and NBA, along with links to their casino games and an extensive list of live in-play markets, which we will get to shortly. Their sports betting markets are sorted alphabetically in their menu, which means that some scrolling is required to get to something like soccer. It can be argued that sports should be sorted by popularity rather than alphabetically, but that is a matter of preference more than anything. ​Betting limits are not set in stone at CloudBet, aside from their minimum wager of .001 BTC, good for less than a dollar under the current bitcoin exchange rate. Maximum bets are all over the map, as CloudBet increases maximums as a game gets closer to its start time, presumably to limit their exposure in the pre-game period where market inefficiencies can be taken advantage of. 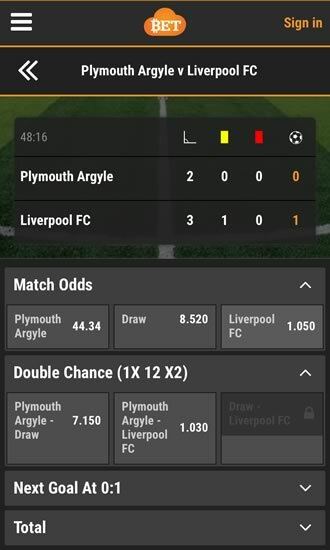 Directly before game time, max wagers depend on which sport is being wagered on as well as the action on each side, one would think, but in trying different markets, this number landed anywhere from 10 to 40 BTC, which is certainly high enough to appease most bettors. While CloudBet's look and feel tend to earn comparisons to fellow bitcoin-only sportsbook Nitrogen Sports, the betting markets offered on CloudBet are well above any bitcoin-only sportsbook at the forefront of that industry. They offer every sport imaginable, including futsal and bandy (which CloudBet taught me was indeed a sport) to go along with the major sports. The biggest key to CloudBet's betting markets, though, is the live in-play wagering offered at CloudBet. Once you arrive at the CloudBet home page, an incredibly long list of games eligible for live in-play betting is presented to you. This list includes lower tier soccer matches, obscure tennis matches, and plenty more to go along with the upper echelon competitions that you would expect to be able to wager on live. 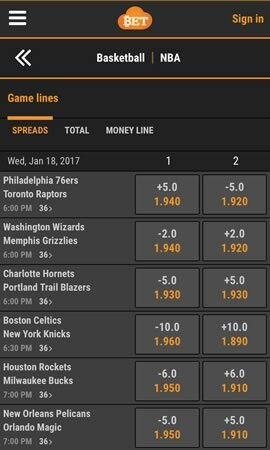 There are also prop bets betting available at CloudBet, such as highest scoring quarter props in the NFL and margins of victory in the NBA. 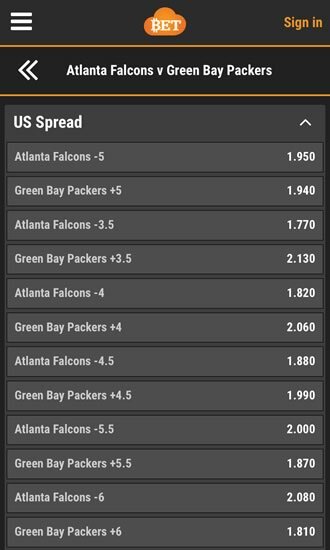 Futures betting is available as well, with an extensive list of division and conference winner wagers to be had in the NFL as the most prominent example. The live in-play offerings along with these future and prop bets were all things that were not made nearly as available over at Nitrogen Sports, and serve as a real point of differentiation between the two iPhone sportsbooks. Making deposits and withdrawals is fast, easy, and free at CloudBet. Only one confirmation is needed for a deposit to be completed successfully, a process that is taken care of nearly instantly. Small withdrawals are similarly fast, while larger withdrawals require more confirmations and will take slightly longer as a result. In any case, CloudBet does not charge its users for making deposits or withdrawals, eliminating one of the biggest frustrations from the online sportsbook experience, as anyone who has been hit with both deposit and withdrawal fees at other sportsbooks can attest to. Support at CloudBet is only done through email, although response times to those emails have been lauded by many as prompt and legitimately helpful. CloudBet does offer two-factor authentication for increased security on your account. Rare for a bitcoin-only sportsbook, CloudBet does offer a deposit bonus to new players, matching their first deposit bitcoin-for-bitcoin, up to 5 BTC. This bonus is paid out in increments of .01 BTC, though, so keep that in mind and make sure their bonus structure works for you before making your first deposit. 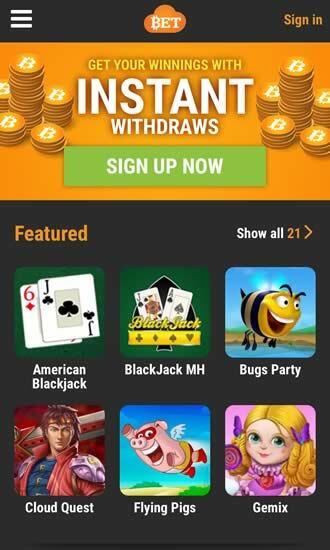 Either way, this is a better bonus than you'll see at other bitcoin-only iPhone sports betting sites, and doesn't require the deposit and withdrawal fees of other sportsbooks. 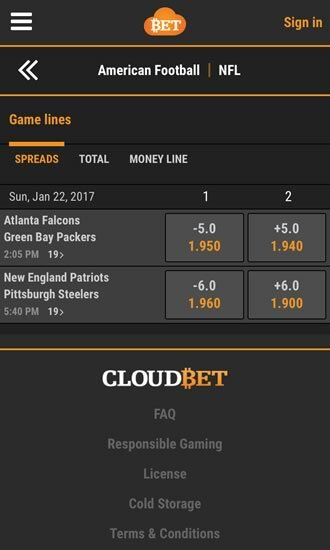 Overall, CloudBet is a strong option for bitcoin sports betting. Their selection of betting markets, specifically live in-play markets are top notch, and their fee free deposits and withdrawals allow players to use all of their funds rather than having to set aside portions of it for those fees elsewhere.